A growing interest in the use of fishes as environmental indicators to assess the health of estuaries has led to an increasing focus in this research area. The improved understanding of the structure and functioning of aquatic ecosystems represents a move away from the chemical criteria that have tended to dominate water-quality management programs in the past. Bioindicators, as currently used in field bioassessment studies, tend to operate at the community level and have a high ecological relevance. In contrast, water-quality indicators operate on a much shorter timescale and do not have the same ecological significance. Figure 3 Diagrammatic outline of the FIR process. 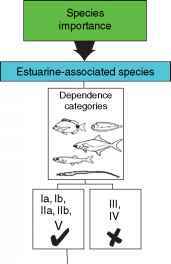 Species importance and estuarine importance components are indicated by black boxes with white lettering. fish species or fish communities are sensitive indicators of the relative health of an aquatic ecosystem. Bioindicators of ecosystem condition have traditionally included single indicators such as species diversity, species dominance, and presence/absence of indicator species. 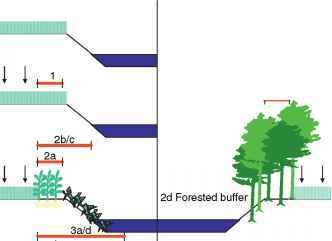 Individually, however, these indicators provide limited information on ecosystem health. In contrast, the EFCI follows a more integrated approach by combining several attributes or metrics into a single multimetric index. Similarly the FIR, which is based on a scoring system of seven criteria, prioritizes estuaries in a region or nation in terms of their importance to estuary-associated fish species. See also: Biological Integrity; Coastal and Estuarine Environments.